An attempt to run Windows Updates from the control panel failed, as the service was corrupt. While in a lot of cases it is probably a good idea to reinstall Windows from scratch following an issue like this, there are some cases where it is not viable. 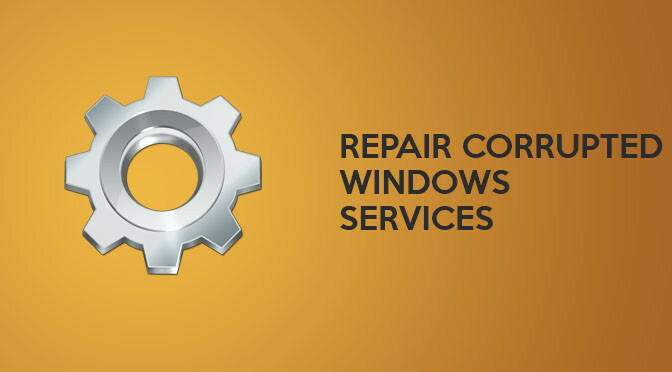 This article is aimed at repairing the Windows Update services after a corruption, however it should also restore any other corrupted services back to their default states. Firstly, download ESET’s Service Repair Tool for Windows. Run the tool in Administrator mode (this is important) by right clicking on ServicesRepair.exe and selecting “Run as administrator”. The Service Repair Tool may prompt you to make sure you wish to proceed, click yes and let the tool do it’s thing. Run the Windows Update Troubleshooter utility from Microsoft for either Windows Vista, Windows 7 or Windows 8. (I ran the fix on Win7 so I can only vouch for the fix working on there, but there should be no problem running the troubleshooters in other versions of Windows). Stop the Windows Update service. This can be done by opening the Run dialogue (Hold the Win key and press R on the keyboard if you can’t find it), type in services.msc and press Enter. Scroll down to ‘Windows Update’, right click on it and select ‘Stop’. Navigate to your ‘Windows’ folder and locate the ‘SoftwareDistribution’ folder. The default path is ‘C:\Windows\SoftwareDistribution\. You will need to rename this folder, rename it to ‘SoftwareDistributionOld’. Lastly, restart the Windows Update service, this is done exactly the same way as you stopped it, but instead of clicking ‘Stop’ you will need to click ‘Start’ instead. Reboot Windows for all the changes to take effect, Windows Update should now work and the rest of your services should be restored. Once you are happy that Windows Update is working correctly, you can delete the ‘SoftwareDistributionOld’ folder. Previous Previous post: Backup & Access Your Entire Music Collection For Free!